After the state reduces funding by more than $5 million for Tift County public schools, the local school system is forced to make reductions -- among them: Six staff furlough days, four fewer instructional days, larger class sizes and elimination of public library funding. Some Tifton talent was on display in a big way this past Tuesday when Tifton native Travis Pratt wowed the judges and the audience on NBC's "America's Got Talent" with his operatic voice -- and he also wowed his girlfriend of five years when he proposed to her on stage on national TV. As The Huffington Post reported, "Travis blew the judges away with his operatic voice -- and ridiculously high range. After hearing that it was his girlfriend who pushed him into doing this, Howie Mandel convinced her to go up on stage. And then, Travis got down on one knee. "I have loved you from the very first moment I laid eyes on you," he told her. "Will you marry me?" She said yes ... and the judges said yes to Travis going on to the next round of the competition. His performance was enough to earn Hollywood Life's top act of the night. Buddy TV loved it, too, saying that it was "a whole lot of big TV' at one time. Pratt has performed recently on stage at the Tift Theatre, doing his Easter show on March 31 and starring in the stage play "Love Unbreakable" at the Tift this past Jan. 27. The Tift County High School graduate now lives in Houston, Texas. Next week, "America's Got Talent" airs an hour earlier, at 8 p.m., on NBC's Tuesday night lineup. 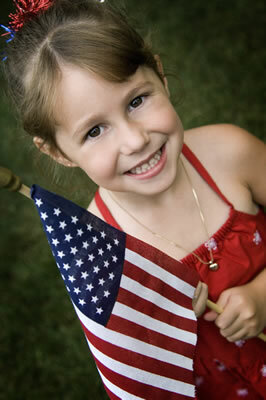 Friday, June 14, is Flag Day, so show your colors proudly throughout the Tiftarea. The Second Continental Congress had determined the design of the American flag on June 14, 1777. There are now 50 stars where there were once 13. Flag Day is now recognized on the "birthday" of the Stars and Stripes as a result of the efforts of a Wisconsin teacher, Bernard John Cigrand. In 1885, Cigrand, a 19-year-old school teacher, placed a small flag in an inkwell and had his students write essays on what the flag meant to them. He called June 14 the flag's birthday. From that day forward, Cigrand dedicated himself to inspire not only his students but all Americans in the real meaning and majesty of our flag. As a result of his efforts, President Woodrow Wilson in 1916 proclaimed Flag Day to be celebrated on the anniversary of the Flag Resolution of 1777. But it was President Harry Truman who in 1949 formally established June 14 as Flag Day in the United States. A turfgrass variety being tested in Tifton is heading to Rio de Janeiro, Brazil, when golf is reintroduced as an Olympic sport at the 2016 games. Zeon Zoysia grass, developed by David Doguet and Blade Runner Farms in Poteet, Texas, is currently being tested on the UGA College of Agricultural and Environmental Sciences' Tifton campus. "It has a stiffer leaf blade so the golf ball sits perfectly in the fairway. Golfers love it," said UGA turfgrass breeder Brian Schwartz. This is the first time golf will be an Olympic event since 1904. The Olympic Committee selected Zeon Zoysia after visiting the Atlanta Athletic Club, where Zeon is used. The grass, which is shade tolerant for rough areas and excels in the sun, is starting to be utilized on more golf courses. The Governor's Awards for the Arts and Humanities honor outstanding individuals and organizations that have made significant contributions to Georgia's civic and cultural vitality through service to the humanities or excellence in the arts. Presented by the Office of the Governor in partnership with Georgia Council for the Arts and the Georgia Humanities Council, the Governor's Awards recognize the value of the arts and humanities in the creation of a thriving economy and their contributions to innovation and growth. The Governor's Awards pay tribute to the most distinguished citizens and organizations that have demonstrated a lifetime commitment to work in these fields. For information about nominations, click here! Simplify your July 4 celebration by letting the cooking team at Literacy Volunteers of Tifton-Tift County prepare your pork. They will be grilling ribs and Boston butts all night July 2 so you can pick your succulent meat up from noon-4 p.m. on July 3. All you will have to add is potato salad and pie. Miss Georgia Forestry Pageant, 5 p.m., Teen Miss and Miss, Performing Arts Center, Tift County High School, Tifton. Keith Evans performs on the patio, 6:30 p.m., Hilton Garden Inn, Tifton. Father's Day: Remember Dad on his Special Day! local Meals on Wheels organization, and an active volunteer in several other community groups, including the 20th Century Library Club, the Special Olympics and several bridge clubs. Convenient county location and move-in ready. Quiet area on large corner lot with plenty of room for family fun. This 1,714-square-foot, 3 BR, 2 bath home has beautiful laminate and tile floors, a spacious kitchen with ample cabinet space, a large pantry, stove, refrigerator and dishwasher. Large bar overlooking family room and open to the kitchen, which also has a breakfast area. Formal dining room or bonus room for office; large family room with French doors to back yard. Custom molding throughout and an alarm system.